This soup is the perfect way to embrace vegetables that are currently in season… at least in the Midwest. My recipe was sparked by a giant summer squash from my local farm market and two large bags of kale from my neighbor’s farm plot that I had in my refrigerator. 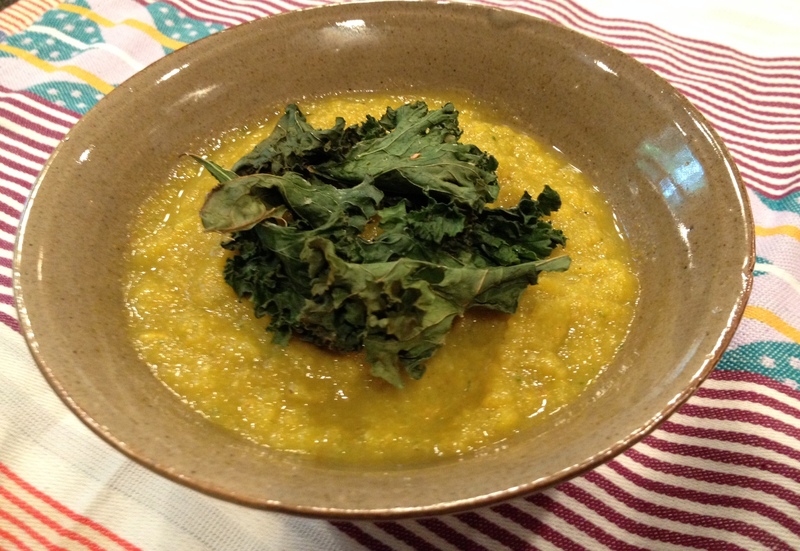 I wanted a way to use them both, so I decided to create this creamy roasted squash soup and top it with crispy kale chips. If you don’t have time to make kale chips yourself, you can use a store brought brand or top the soup with another crunchy topping. In addition to the kale, I also used green onion that my neighbor dropped off and thyme and chive from my backyard herb garden. Not sure if it was my imagine or not, but I’m pretty sure using all the local ingredients made this soup extra delicious! Preheat oven to 475 degrees. Place a sheet of aluminum foil on a baking sheet. Coat the foil with oil spray of choice. Arrange the squash pieces on the sheet, spray with oil and season with salt and pepper. Roast in the oven for 25-30 minutes or until they begin to brown on the edges. Meanwhile, bring water or broth to a boil in a small soup pot, and add crushed garlic, celery, carrot, onion and chive. Season with salt and pepper. Cook for 5-10 minutes or until the veggies are soft. Then add thyme, cumin and coriander and cook for another 2 minutes. Add mustard and reduce to simmer. When the squash is done, use a spatula to put the pieces into the soup pot and blend well with an immersion blender. Bring to a low boil and reduce to simmer for 10 minutes. If using a traditional blender, add both the contents of the soup pot and squash to the blender and puree until smooth. Then transfer the soup back to the pot, bring to a boil and simmer for the same time. Makes one big bowl of soup. Top it off with something crunchy.